Corbin is an enrolled member of the Yakama Nation and was born and raised in Toppenish, WA and Glenwood, WA. He graduated from Heritage University with a B.S. in Biomedical Sciences in 2018 and is currently a PhD student at Oregon State University majoring in microbiology. Corbin is interested in infectious diseases, fish diseases, and transmission dynamics in aquatic systems. His current project, in collaboration with the Zebrafish International Resource Center (ZIRC) in Eugene, OR, aims to characterize the disease transmission dynamics of Pseudoloma neurophilia, a prevalent infectious pathogen present in nearly half of all zebrafish facilities across the country that report to ZIRC. 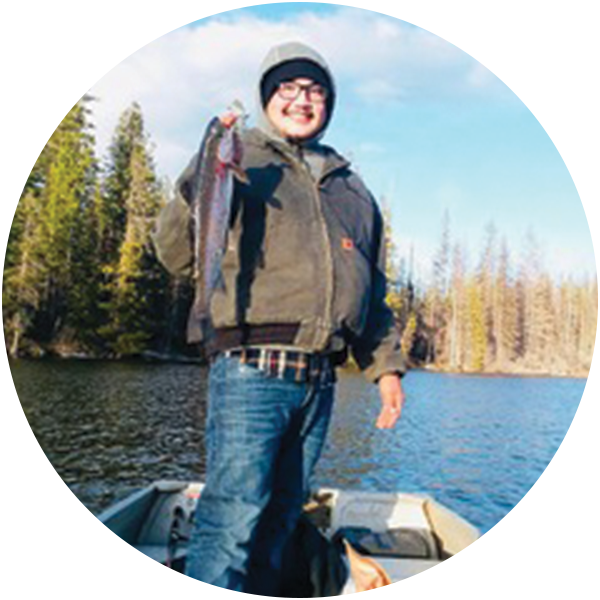 The goal of his project is to develop a novel noninvasive detection assay that can be made readily available for immediate detection and eradication from all zebrafish research facilities. Corbin also currently sits on the Department of Microbiology Core Values committee, which works to promote diversity and inclusion at Oregon State University by creating safe discussion for minority and underrepresented students, faculty, and staff. Elaine is currently employed by the Yakama Nation Fisheries Resource Management Program as a Fish Biologist III since 2006. She is the project manager of the Rock Creek Fish and Habitat Project since 2008. She earned her B.S. degree in Aquatic and Fisheries Science from University of Washington in 2003 and her M.S. degree in Resource Management from Central Washington University in 2010. Her doctorate research will be focused on climate change and impacts to the Plateau Tribe first foods and medicines. In particular, she will focus on a traditional gathering restoration site that has been altered significantly by anthropogenic alterations and multi-year droughts. Restoration process, monitoring, and lessons learned will be a part of her thesis research and writing. Darryl grew up on the Acoma Reservation in New Mexico. He earned his B.S. in geology at New Mexico State University and his M.S. in geology at Purdue University. He is currently a PhD candidate in the EAPS Department at Purdue University. His doctoral research is focused on implementing and evaluating geoscience educational modules that were developed using Indigenous Research Frameworks that emphasize the cultural connections of Indigenous students to Western scientific concepts within introductory geoscience course materials. The purpose of this research is to increase the number of underrepresented students who pursue advanced degrees in STEM fields. Kimberly’s research at the University of Washington focuses on habitat connectivity, identifying patterns of productivity among habitat units, and the distribution of Pacific salmonids in response to changes in geomorphology and anthropogenic influences. Kimberly earned a Master of Science in Environmental Science and Management from Portland State University, where she explored watershed system responses to climate change and forest fires using hydrologic and runoff models. She is broadly interested in stream morphology and the energy dynamics of the carbon cycle in aquatic and forest ecosystems. She is also interested in developing tribal capacity for climate adaptation planning and the management of cultural resources at the urban-rural interface. The culture and traditions of the Nimiipuu emphasize environmental stewardship and drives Ciarra’s academic, professional, and personal endeavors. She earned her BS in Chemistry from Northern Arizona University, where she researched uranium in Navajo communities. She has completed internships with her tribe, the US Dept. of Energy, US Environmental Protection Agency, and Institute of Tribal Environmental Professionals. Her professional experience includes environmental science and education in tribal and urban Native communities. Currently Ciarra is pursuing her MS degree in Science Teaching at Portland State University focusing on traditional ecological knowledge and STEM education. Amy is a member of the Chukchansi Tribe located in Central California and grew up on the Kitsap Peninsula in Western Washington. She graduated from Northwest Indian College in June 2017, with a Bachelor of Science in Native Environmental Science and a concentration in Ethnoecology. She is currently earning a Master of Science in Environmental Science in the Marine and Estuarine Science Program at Western Washington University. Amy’s thesis research is in partnership with WSÁNEĆ and Hul’q’umi’num First Nations Communities, and she is surveying beaches in the Southern Gulf Islands of B.C. Canada. Her research focuses on intertidally sourced Coast Salish foods, habitat complexity, and the environmental parameters of clam gardens and intertidal beaches. I am from Montana and Oregon and grew up being exposed to nature regularly which is why I decided to pursue a career in Natural Resource Management. I am graduating in June 2017 with an M.S. and am interested in pursuing a PhD afterwards because I enjoy participating in all aspects of research. My current research focuses on modeling the environmental factors that influence Pileated woodpecker foraging habitat in young coastal forests. In the future I would like to be mobile and teach at several small colleges across the Pacific Northwest and continue to be involved with field work during the summer. Victoria A. Walsey is a member of the Confederated Tribes and Bands of the Yakama Nation and descendent of the Confederated Tribes of the Warm Springs. She earned an Associates of Sciences Degree from Northwest Indian College and attained her Bachelors from the University of Kansas in Environmental Sciences and a Masters in Indigenous Studies. Her Masters work focuses on Resources Management issues of Indigenous peoples in the United States, New Zealand, and Canada. She is currently a PhD candidate in the department of Geography at the University of Kansas. She is also a National Science Foundation Integrative Graduate Education and Research Training (IGERT) Fellow in the Climate Change, Humans, and Nature in the Global Environment (C-CHANGE) program. Her current research is on bridging communication gaps between resource management systems and fishers along the Yukon River to aid cultural and traditional knowledge systems of fishers. Danielle is a member of the Nez Perce Tribe located in Lapwai, Idaho. She received her bachelor’s degree from the University of Idaho in Human Nutrition and Sustainable Cropping Systems with an emphasis in Environmental Horticulture. She is currently working towards her Master’s degree in Horticulture at Washington State University. The main objective of her research is to develop pre-breeding resources for developing dwarfing pear rootstocks.